I went to see the Finnish version of Wicked two days ago and had lots of fun. The music was, as usual, very grand and catchy with big orchestrations and talented singers, and the visuals amazed me more than once. Not a boring moment! Today Helsingin Sanomat, Finland's biggest newspaper, released their critic Suna Vuori's review of the show. As I guessed when picking the paper from the mailbox, the critique hardly found anything good with the show. The story is a "quickly forgettable mess", the themes of the piece are "the most ordinary", the music is "unmoving and disposable", the dancing is "fast food, self-evident filler", the political references "slip to the state of incomprehensibleness", the moral is "unclear from the beginning", there are "dead moments" all along the show and even the characters lose all their charm during second act. At least, and as her only positive words, Vuori mentions how the leading ladies did a great job and how the visuals save some of the dead scenes. In her comment she adds that it's odd how Elphaba doesn't mourn and Nessa's death and how even her 11 years old kid got bored in the theatre. This review made my blood pressure go up by several notches. Sure! The story of Wicked might not be on the same level as the classics like Jesus Christ Superstar or Les Misérables! Sure! The music of Wicked doesn't quite live up to Stephen Sondheim's Sweeney Todd! Sure! The dancing is worse than in freaking Swan Lake! But seriously, I hope there's never enough cynicism and hate towards life in me to become a newspaper critic. "The singers had strong and emotionally rich voices - especially Elphaba's voice was lovely. There was great dancing with smooth movements, beautiful costumes and sets and epic music! Also, I thought the story wasn't predictable. As a whole, the show inspired me!" Secondly, let's take a closer look at Vuori's opinions and try to anwer to them, one by one. The story was a quickly forgettable mess. I admit I can see Vuori's point here, even though I don't compeletly agree. Especially considering The Wizard of Oz isn't a tale every kid is familiar with in Finland, the story can seem a bit difficult to Finns. As I've noticed before, the whole Animal rights subplot seemed rushed to me. Despite that, I really wouldn't claim the story forgettable! Am I wrong, or aren't there thousands of people who have indentified with Elphaba and found her story touching? The themes of the piece are the most ordinary. As the themes, Vuori mentions good, evil, being different and friendship. Let's think about some other classic pieces of musical theatre. West Side Story: being different. Sweeney Todd: evil. Les Misérables: good, evil. The Phantom of the Opera: being different. RENT: being different, friendship. Yep. Wicked's themes seem to be the most ordinary. But if we start hating these themes we also have to start hating about every musical out there! In my opinion, this thought could be turned upside down: it's admirable how Wicked manages to be entertaining and feel fresh when tackling with such common - or actually, not common, but universal - issues. The music is unmoving and disposable. CD Universe all time sales rank for Wicked's original Broadway cast recording: #19. Amazon.com bestsellers rank: #60 in all music, #5 in Broadway Vocalists. Amazon.co.uk bestsellers rank: #158 in all music, #2 in Musicals. Tower.com sales rank: #40 in all music, #6 in soundtrack. Maybe this tiny peek at the CD sales tell something about how unmoving and disposable people think the music is. And as my own opinion, I can say Defying Gravity is one of the about four songs that have ever made me cry, and hearing Maria Ylipää's "The Wizard and I" live two days ago made shivers run down my spine. Maybe the music isn't all perfect, but I think it's wrong to claim it unmoving. In my opinion, it's packed with strong feelings! The dancing is fast food, self-evident filler. Both me and my friend missed Elphaba's entrance to the Ozdust Ballroom because we were enchanted by Fiyero's (Tuukka Leppänen) dancing. The political references slip to the state of incomprehensibleness. For this version of Wicked, I pretty much have to agree here. First, I feel so embarrassed that until reading Vuori's review I didn't realise the Finnish Wizard is meant to be a Stalin look-a-like (see a picture here) - now, when looking at the picture, it's so obvious! However, I think this will fly over the heads of a lot of the audience, at least the youngest part of it. The moral is unclear from the beginning. Granted, the Animals subplot could be more visible, but it's not the only part of the story's moral Vuori critiques. She also doesn't get "what moral is included into good's transformation to evil and evil's transformation to good". "Is the messy story's moral, perhaps, that people will transform into what others think they are", she questions. "Or that it's dangerous to get all you want?" Let me tell you: yes, the moral of the story has to do with becoming what others think you are. You could argue that's the main point of the story, Elphaba becoming evil because everybody keeps going on about how wicked she is. Glad you got it, even though it seemed so unclear to you! Where? I didn't notice any, I thought they were all well alive and kicking. The characters lose all their charm during second act. Vuori thinks "Elphaba's bitterness and isolation makes her boring and grumpy, while Glinda's character loses its shine and becomes a cardboard cutout". If so, it has to do with Baum's original book, since the second act brings the characters closer to the originals. I think especially Glinda doesn't become boring: she shows she can be a strong leader and probably feels secretly sad for the rest of her life because of Elphaba's death and Fiyero's disappearance, even though she can never show that to anyone. I think that's far from cardboard! And as for Elphaba, she sure becomes angrier - but that's kind of the point of being a bad witch, huh? And maybe the weird obsession about the shoes was Elphaba's way to mourn? Nessa is one of the people she mentions in No Good Deed, motivating her decision to stop trying to do good. I'm sure Elphaba did mourn her - but adding a scene with her crying about it wouldn't have added enough to the plot, so it was better left undone. The people who comment on the theatre's homepage are backing me up with this: there are already many comments about the too strong and unfair "critiquefying" of Wicked. It seems Finnish audiences love the show - too bad the newspaper managed to find a hater and paid for her to bring her hate to everybody's breakfast table. Wicked isn't the deepest or the most thought-provoking show out there. But it's one of the sweetest eye and ear candies in the world of musical theatre, not completely without its share of touching moments! If you haven't swallowed a lemon whole before entering the theatre, I bet you'll have a really fun evening filled with songs you're going to hum along the whole next week! See my long review of the show at this link. Pictures here from Helsingin Kaupunginteatteri's site. "A New Musical from an Enchanted Land"
As I predicted, a writer's block struck me almost immediately after writing the last post and I've been cruelly neglecting this little blog for weeks. But today, upon finding out that at least one people has read my writings, I'm full with new hope and confidence! A special thank you for that! And now, to the actual subject of this post: I'm starting to get very excited about the upcoming Finnish premiere of Wicked. The first non-replica production in the world, I might add! Wicked's not one of my absolute top favourite musicals, though. I've seen it live once but due to the very sad news I'd heard just before the show I was in a really wrong mood to enjoy it. I like the cast recording, however. But what really excites me here is the idea of a non-replica production. I don't particularly like the idea of replica productions. Of course, I'm biased since I've had the chance to see shows on both Broadway and West End and don't need the opportunity to see copies of them. But something about a show being the same in every place around the globe doesn't appeal to me. Partly because I think directors should get the chance to put their own vision of the material onstage and shouldn't be stuck supervising a new production of someone else's concept. And partly because some replica productions get so expensive no theatre in Finland has the chance to do them. The Phantom of the Opera, for example, isn't likely to get a Finnish version with such a cost. But this new version of Wicked certainly is interesting! It's got my favourite Finnish actor, Tuukka Leppänen, as Fiyero, and the new designs and costumes seem intriguing. The theatre doing Wicked hasn't made it possible for other people than reporters to get their press photos, though. I hate when they do that - what harm could be done giving the pictures to everybody so they can blog about your show? I'd still very much like to say a couple of things about what I've got to see so far in their online magazine - it has a realistic page turning gadget that's really fun to play with, I might add. So, let's click that link and have a look! First, let's talk about the cover - or actually, let's talk about their photos and marketing strategy in general. I've been frustrated with a couple of things with this. Firstly, I don't understand how hard it can be to do the green makeup for the actress playing Elphaba for the photoshoots. Let's take the logo they're using in all their ads for example. It can be seen at here. Talk about horrible photoshopping... Were they consiciously going for the plastic feeling or were they just unfortunate to have some intern do their artwork? Whatever the case, now this photoshop disaster can be seen all around Helsinki, often in gigantic size. Actually, their marketing is pretty messed altogether. The Wizard of Oz isn't that known in Finland, and I get the feeling they're trying to avoid the subject. Their press release only mentioned Gregory Maguire's Wicked, there wasn't a word about the whole thing being based on The Wonderful Wizard of Oz! The intro on the theatre's homepage isn't better in any way. Well, it does mention Baum's book, but otherwise it's a horribly written mess. It's done by a journalist who was apparently having a really bad day - it's hard to find any facts or even sense in the article. I'm afraid no one who doesn't know about the musical already will have the slightest idea what it's about after reading it. The tagline, "A new musical from an enchanted world", says nothing about anything. But back to the pictures. The cover of the web magazine is already a lot better and doesn't scream "Photoshop!" 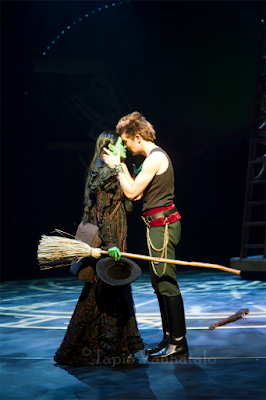 so loudly anymore, if we manage to ignore Elphaba's lips. And, turning to the first page, we get a little sneak peek of As Long As You're Mine. I believe the tattoo on Fiyero's neck is a new idea, and I like it! 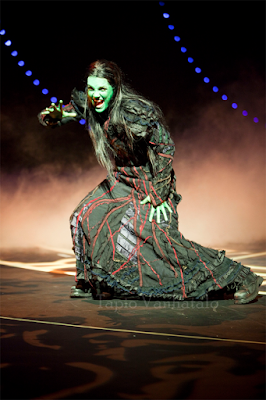 Also, Elphaba's lips are finally red on stage, not only in posters! Turning page again we get more photos. At least my gaze went straight to Elphaba's dress. And I think it looks lovely, the red stripes and the slight transparency on the sleeves are interesting details. And the quite heavy-looking boots fits her character perfectly, at least in my opinion! Fiyero's costume, then again, is pretty dull, but that's understandable - we wouldn't want the supporting romantic interest to outshine our heroine! Higher on the page we see Glinda in her bubble. I've a feeling this one won't blow soap bubbles as it floats around, but I like the design. Much more bubble-like than the original, I think. Turning the page, we see Glinda in the dress she was wearing in the bubble, apparently. Quite different from the original, there's not such a strong movie influence here. I'm not sure if I like this one or not... The colour isn't one of my favourites, but then again, I should see the whole thing before saying anything. But what confuses me is that Dorothy seems to be hanging out in the background. What? Have they found a place in the musical for her? Very weird, I can't wait to see what's that about! Turning page yet again we see Madame Morrible, I guess. Very interesting hairdo, I'd say, but not in a bad way! No more pictures here, though, and that's the end of the Wicked part of the magazine. Anyway, the text on the Madame Morrible page deserves a mention before I finish my own writing for tonight. It says that Stephen Schwartz will be attending the Finnish premiere. And guess who is also going to that premiere! Schwartz isn't my favourite composer, but still, I don't think any musical fan can handle the prospect of seeing a famous musical composer/lyricist live without feeling excited!